This remote control X-Wing fighter really flies! Built from tough crash-resistant materials. Recreate your favorite battle scenes from Star Wars! 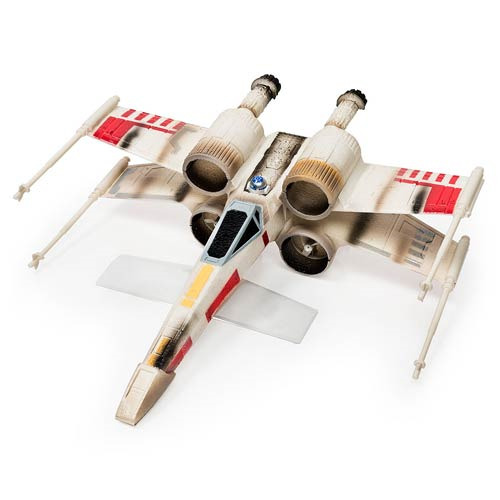 Take on the Empire with this flying Air Hogs Star Wars X-Wing Fighter Vehicle! Fly into attack position as a Rebel Alliance pilot and experience the thrill of Star Wars outdoors. The X-Wing uses true ducted fans embedded in its wings to power its flight, letting you speed through the canyons of the Death Star as you recreate your favorite battle scenes. It uses 2.4 GHz communication for superior control, and delivers a flying range of up to 250 feet! Built from crash-resistant materials, the X-Wing's authentic design stands up to the toughest crash landings. Requires 6x "AA" batteries (not included). Measures approximately 16 1/2-inches with an approximately 15-inch wingspan. Ages 10 and up.